Fifty years ago today, the first episode of Star Trek, "The Man Trap" premiered on NBC. With over 700 episodes spanning five series and thirteen movies, Star Trek is one of the longest and most praised cultural icons of our time. I've been watching Trek since I was a toddler. Born 20 years after The Original Series premiered, I am of the Picard and Riker generation more than the Kirk and Spock incarnation. In a few weeks, I turn 30 and I still watch this series as religiously as I did as a child. I've long joked that I've carried two religions with me my entire life: Christianity and Star Trek. Odd as it may seem to compare one of history's most prevalent religions to a science fiction program, both Christianity and Star Trek shaped my understanding of respect, love, and collaboration that can exist in our world if we truly loved neighbor as self. On this 50th anniversary of Star Trek, articles are being written in mass on how the longstanding nature of Trek is due to its forward-thinking ideals. Star Trek not only made viewers think, but it made many have a hope for a better tomorrow. The central premise of Star Trek is that we can live united and equal in a diverse universe. This significance is not merely reflective of the past few decades. Star Trek continues to serve as a moral guide though the contentious political, social, and religious time period in which we live. 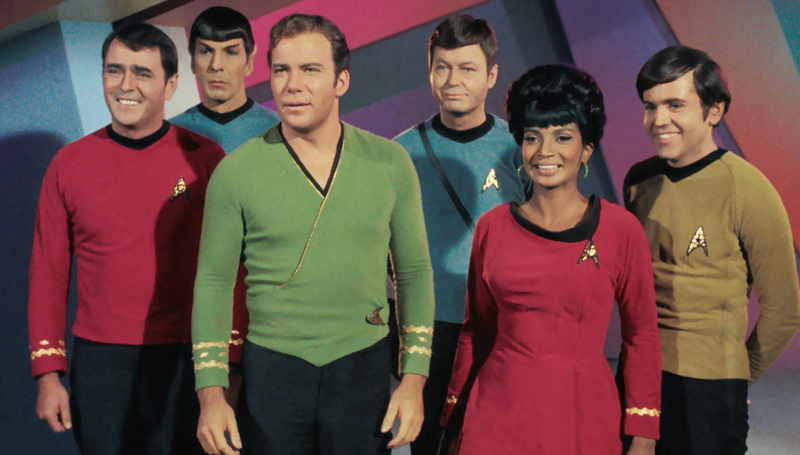 Specifically, Star Trek can serve as a model of living in a religiously pluralistic world. It goes without saying that much of Trek is post-religion. The Next Generation's Captain Picard on more than once occasion dismissed alien religions as ancient myths which others have evolved past. Yet religious pluralism is quietly one of the most valued themes elsewhere in the Star Trek mythos. The setting of Star Trek: Deep Space Nine is a space station where several alien species find themselves living and working while holding different religious beliefs. In an episode in DS9's final season, we see a few human characters help Worf, a Klingon, get his deceased wife into "Klingon heaven." Despite not believing in Klingon religious rituals or conception of the afterlife, these men acted as friends who valued their comrade's religious convictions. We likewise see the main crew protect the religious and cultural values of the Bajorans throughout the entire series. Star Trek does not settle for mere tolerance of others. It embraces plurality and fosters respect and embrace of different religious beliefs. This manifestation of respect breathes life into Star Trek's hopeful, pluralist ideal. Set in the 23rd Century and beyond, Trek does not explicitly recite the freedom of religion in the way many Americans currently do. The fictional equivalent Star Trek advances is the Prime Directive - the governing universal law which prohibits humans from interfering in the evolution or cultural-religious beliefs of the aliens they encounter. Yet this law is more than a moral principle - the Prime Directive cultivates respect for a plurality of beliefs and encourages a community that lives and works together despite fundamental personal differences. The Prime Directive does not need to be relegated to fiction or some lofty, unrealistic ideal. We have the capacity to embody it in the 21st Century. The pluralism that the Prime Directive protects is similar to the American conception of the freedom of religion. The difference is that the world of Star Trek demonstrates what the freedom of religion should look like in our time. Too often, however, we allow our disagreements, no matter how significant or petty, to divide our communities. Instead of valuing the human capacity for belief in the divine, we distort this beauty into an ugly mechanism of division and oppression. Religious pluralism is not a threat to our personal religious beliefs; rather, it is evidence that religious liberty is flourishing. We ought to welcome plurality as its existence represents that we are progressing towards living out the freedom of religion. So in this tumultuous 21st Century landscape I look the the final frontier and learn about how to live united in a diverse world.